The Caucasians trailed most of the game, but prevailed late as Les pitched well and had the game-winning RBI in a 3-2 win over Bobby Brown in game 2 of their best-of-five series. 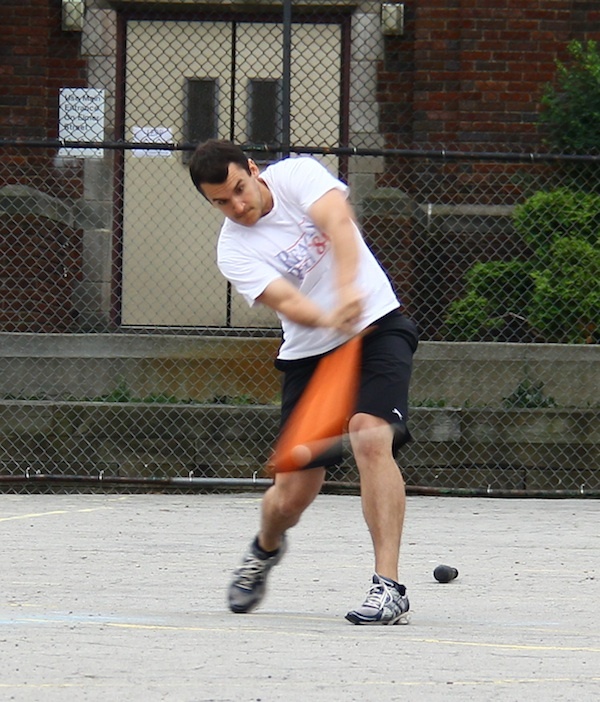 After getting destroyed in game 1, Bobby Brown had a much stronger defensive performance in game 2 against the Caucasians. Les started on the mound against Bobby Brown, and fell behind early. After retiring Mark to start the game, Brad blasted a solo shot to deep left field, putting Bobby Brown up 1-0 early. Les retired Cody to end the inning with a one-run deficit. Morrison led off the bottom of the first with a double, and moved to third when Ron grounded out to left for the first out of the inning. With one out and a runner on third, Guthrie singled, scoring Morrison and tying the game at 1-1. Les followed with a single, putting runners on first and second with one out, and it looked like the Caucasians were about to repeat their huge first inning in game 1. But Mark, Bobby Brown’s starting pitcher, got out of the jam, retiring the red-hot Morrison to end the first and strand both runners. Les retired Holly to lead off the top of the second, and after Mark singled with one out, Brad flew out to center for the second out of the inning. Mark had a much easier second inning, retiring Ron and Guthrie in order for a scoreless frame. Cody grounded out to left for the first out in the top of the third, and following a Holly single, Mark was retired to end the inning. Les singled to lead off the bottom of the third, but Mark stranded him at first, retiring Morrison and Ron in order. Brad grounded out to center for the first out of the top of the fourth, but Bobby Brown would take the lead when Cody hit a solo bomb to center field, making the score 2-1. Les retired Holly to end the inning and minimize the damage. As they did in the bottom of the first, the Caucasians immediately responded in the bottom of the fourth. Mark retired Guthrie to start the inning, but Les followed with a solo blast to center, tying the game at 2-2. Morrison followed with a single, but fell down in between first and second trying to extend the hit into a double, and was retired for the second out of the inning. With the game tied at 2-2, Bobby Brown couldn’t regain the lead in the top of the fifth. Les cruised through the inning, retiring Mark and Brad in order. Ron led off the bottom of the fifth by flying out to Mark at the mound, and Bobby Brown was an out away from heading into the final frame with the game tied. But the Caucasians, as they have all season, responded when it mattered most. Guthrie singled with one out, and Les followed with a double off the fence. Guthrie raced from first to home to score, putting the Caucasians ahead for the first time in the game 3-2. Morrison followed with a single, putting runners at first and third with one out. But Mark avoided a big inning, getting Ron to ground out to left for the second out of the inning, stranding both runners. Down 3-2, Bobby Brown was down to their final at-bat. Cody led off the inning by grounding out to Morrison in left for the first out, but Holly followed with a one-out single. With the tying run at first, Mark doubled, pushing Holly to third and putting runners on second and third. With out one, the tying run on third and the go-ahead run on second, Brad came to the plate. But Les locked down and got Brad to ground out to Morrison in left, stranding both runners to end the inning and the game. 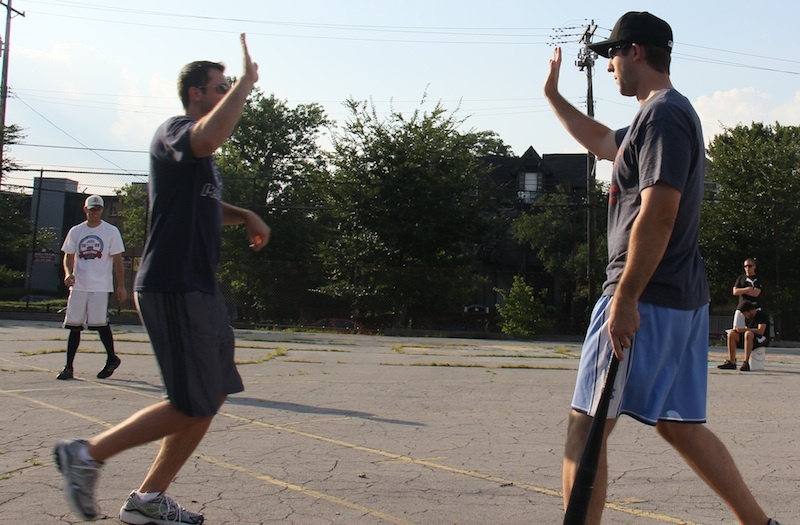 The 3-2 put the Caucasians up 2-0 over Downtown Bobby Brown in their best-of-five series, and putting the Caucasians one win away from returning to the Wiffle Series for the second consecutive season. – Les led the Caucasians, going 4 for 4 in the game with 2 singles, a double, a homer, and 2 RBI. He also pitched the complete game win, giving up 2 ER while scattering 6 hits. 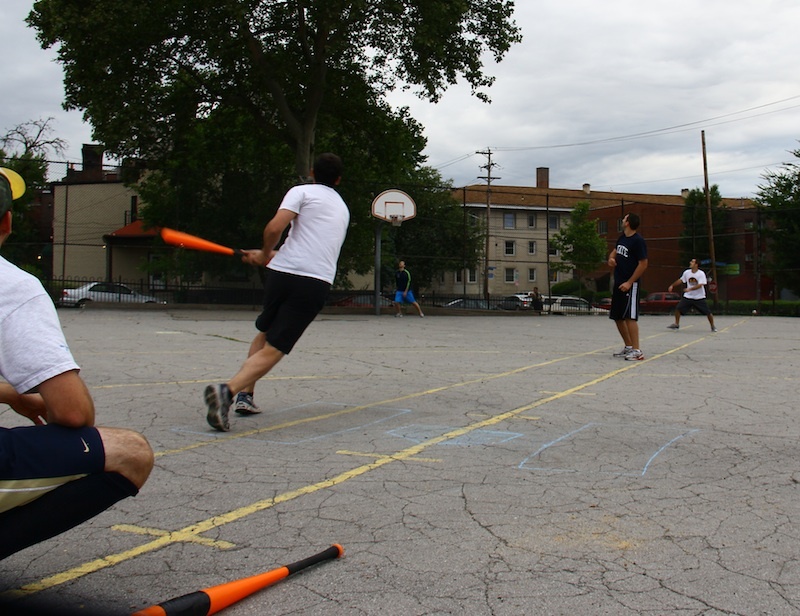 The Caucasians, last year’s runner-up in the Wiffle Series, started the 2012 EWL playoffs on the right foot, as Guthrie shut down Bobby Brown, and the Caucasians offensive exploded for a 14-1 win. 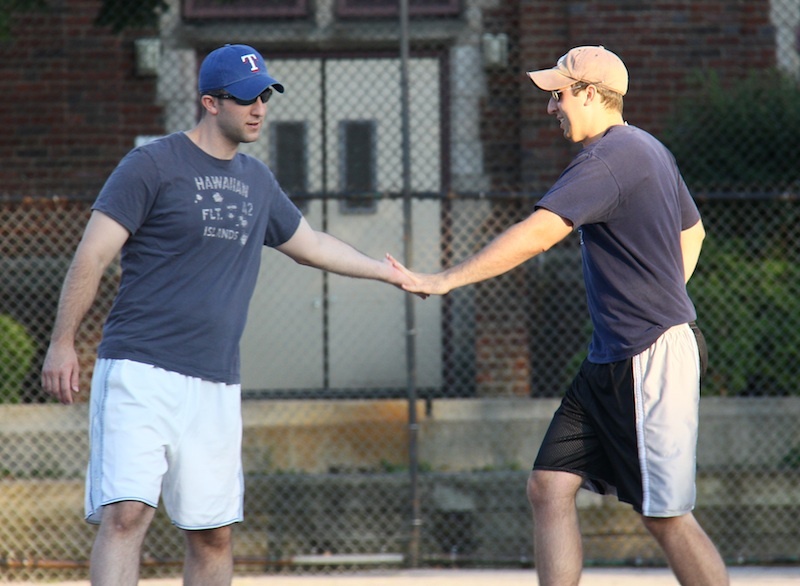 The Caucasians, who dominated the second half of the EWL season to claim the #1 seed for the second consecutive year, faced off against the #4 seed Downtown Bobby Brown to start the 2012 playoffs. 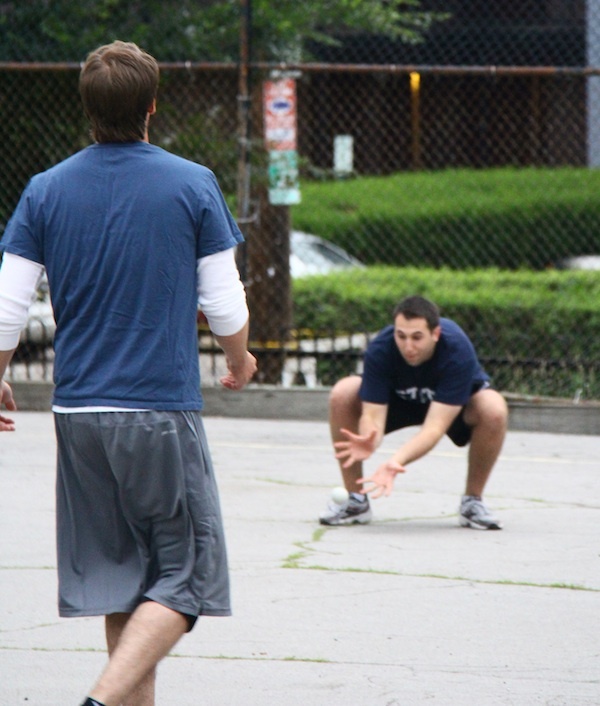 Downtown Bobby Brown, formerly Pumice on Slow!, was swept by the Caucasians in the first round of the 2011 playoffs. Guthrie, who gave up 1 hit over two complete game wins in the first round of last year’s EWL playoffs, started on the mound for the Caucasians. Mark, who had a fantastic rookie season for Bobby Brown, led off the playoffs with a deep solo homer to right, putting Bobby Brown up 1-0 early. Unfortunately, it would be the only run Bobby Brown would score in the game. After giving up the bomb, Guthrie locked down, retiring Brad, and following a single by Cody, got Holly to groundout to left to end the first inning. Down 1-0, the Caucasians crushed Holly, Bobby Brown’s starting pitcher, for 9 runs in the bottom of the first. Morrison led off the inning with a homer, and Ron followed with a home run of his own, making back-to-back jacks to start the game. Guthrie and Les singled with no outs, and Morrison hit his second consecutive homer in as many at-bats, a 3-run bomb that put the Caucasians up 5-1. Ron followed with a single, and with a runner on first, Guthrie blasted a 2-run homer, making the score 7-1. Les and Morrison each singled, and with runners on first and second, Ron tripled, driving in both runners with his third hit of the inning. Ron was caught in between third and home for the first out of the inning, but the score was 9-1. Holly then retired Guthrie to end the disastrous inning. Guthrie cruised through the top of the second, giving up a single to Brad but stranding him at first for a scoreless inning. Holly settled down in the bottom of the second, pitching a scoreless inning and stranding Morrison, who singled for his fourth hit in the game, at first. The offense was quieted in the third, as Guthrie retired Holly and Mark consecutively, and Holly returned the favor by retiring Les and Morrison after Guthrie singled, stranding him at first. Brad singled to lead off the fourth, but Guthrie held him there, retiring Cody and Holly in order to maintain the 9-1 lead. The Caucasians would add to their lead in the bottom of the fourth. Ron grounded out to left for the first out of the inning, but Guthrie followed with a single. With Guthrie on first, Les pounded a 2-run bomb to left-center, extending the lead to 11-1. Morrison followed with a solo shot, his third homer of the game, and the Caucasians had an eleven run lead. Holly then retired Ron to end the inning. Mark and Brad each singled to lead off the top of the fifth, but Bobby Brown couldn’t cut into the deficit. Guthrie retired Cody and Holly in order, stranding both runners and ending the inning. Guthrie singled to start the bottom of the fifth, and moved to second when Les grounded out for the first out of the inning. With a runner on second, Morrison tripled, scoring Guthrie and making the score 13-1. The next batter, Ron, singled, scoring Morrison from third and pushing the lead to 14-1. Holly fanned Guthrie for the second out of the inning with the deficit at thirteen runs. Bobby Brown went quietly in the top of the sixth, as Guthrie retired their two most potent hitters, Mark and Brad, to end the game. 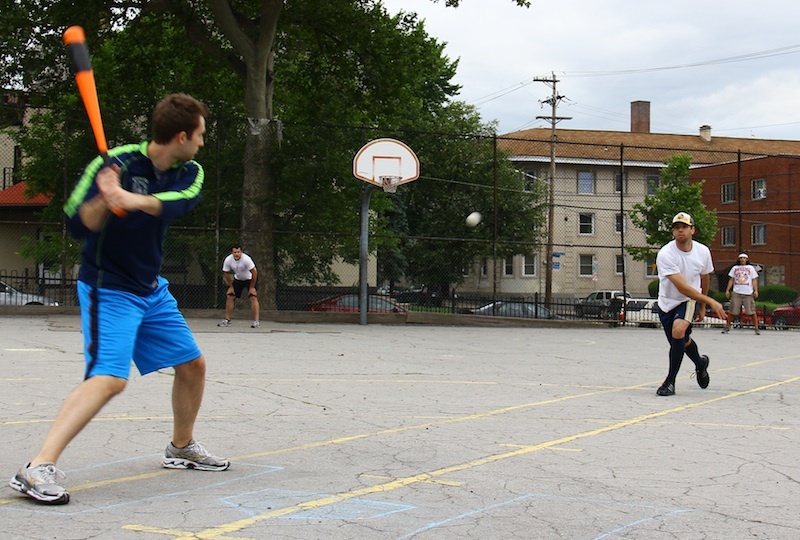 The Caucasians went up early and the game was never in question, as they took a 1-0 lead in the best of five series. – Morrison led the Caucasians going 6 for 7 with 3 homers and 6 RBI. – In three first round postseason starts, Guthrie is now 3-0 and has given up only 1 ER on 7 hits in 18 IP. – Mark and Brad led Bobby Brown offensively. Mark went 2 for 5 with a solo homer and 1 RBI, and Brad went 3 for 5 with three singles. 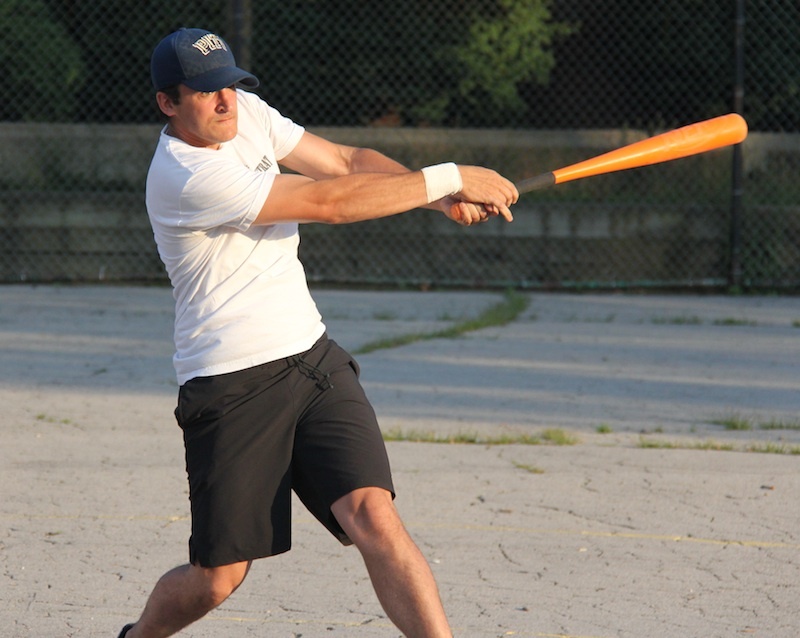 Down 8-3 coming into their final at-bat, the Ham Slams scored 5 runs with no outs in the top of the sixth, then pulled ahead and beat Bobby Brown 9-8 in the seventh inning. 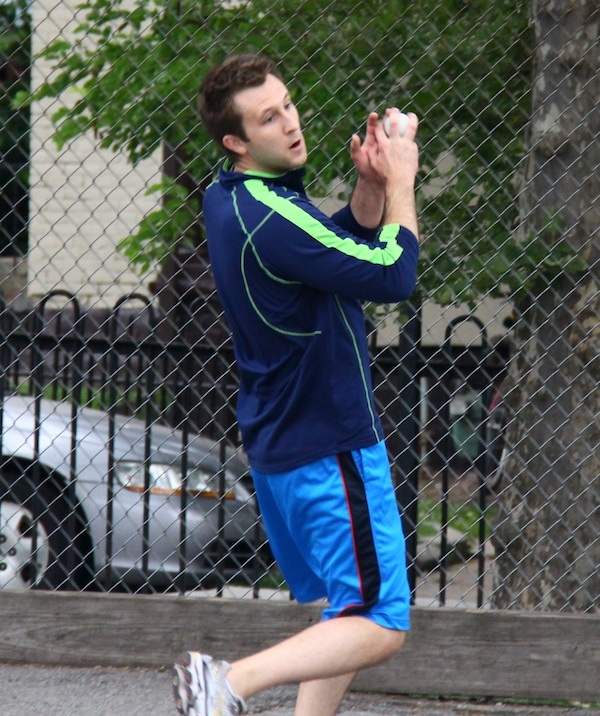 In the second game of their week 7 double-header, Bobby Brown returned to Gaurav, who pitched a gem but took a loss in their previous game. He started well, as Anthony and Evan were sent down in order in the top of the first. 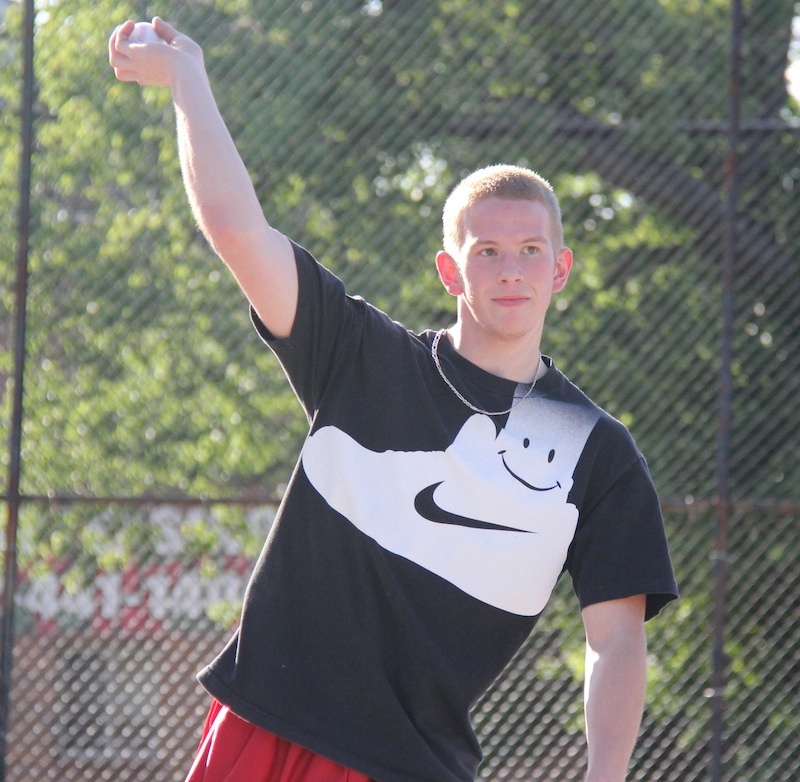 Steve, who was dominant in the Slams previous win over Bobby Brown, was the starting pitcher and was hit hard early. Bobby Brown came out of the gates firing, starting with Mark, who led off the game with a solo homer. Brad followed with a double, and moved to third when Gaurav singled. 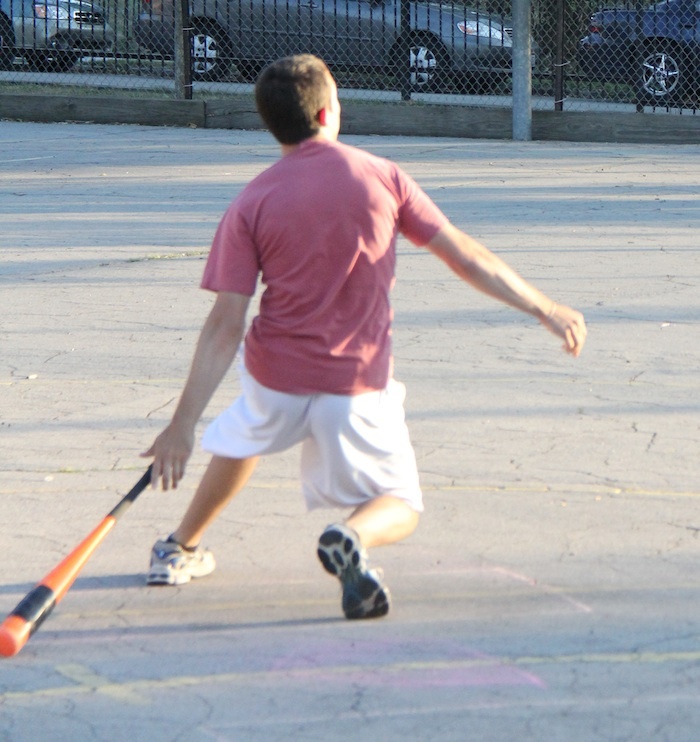 Gaurav was caught making a base running error, however, and was retired for the first out of the inning. Bobby Brown wasn’t shaken, as Holly singled, driving in Brad and making the score 2-0 early. With a runner on first and one out, Mark crushed a two-run bomb to the opposite field, his second homer of the first inning. Brad made Lentz-back-to-back homers, as he hit a solo shot, putting Bobby Brown up five runs. Gaurav was unable to keep the inning going, as he flew out to center for the second out. With some run support, Gaurav held the lead in the top of the second. Steve led off the inning with a triple, but Gaurav struck out TJ for the first out of the inning before Alec grounded out to left, stranding the runner on third and ending the inning. The Slams and Steve pulled things together in the bottom of the second, as he retired Holly and Mark in order for a scoreless inning. The Slams cut into the 5-run deficit in the top of the third, starting when Anthony led off the inning with an inside-the-park homer, putting the Ham Slams on the board. Evan followed with a single, and moved to second when Steve singled. TJ then grounded out to left for the first out of the inning, but with runners on first and second and one out, Alec singled, scoring Evan. Gaurav ended the rally there, as Anthony grounded out to left for the second out of the inning. 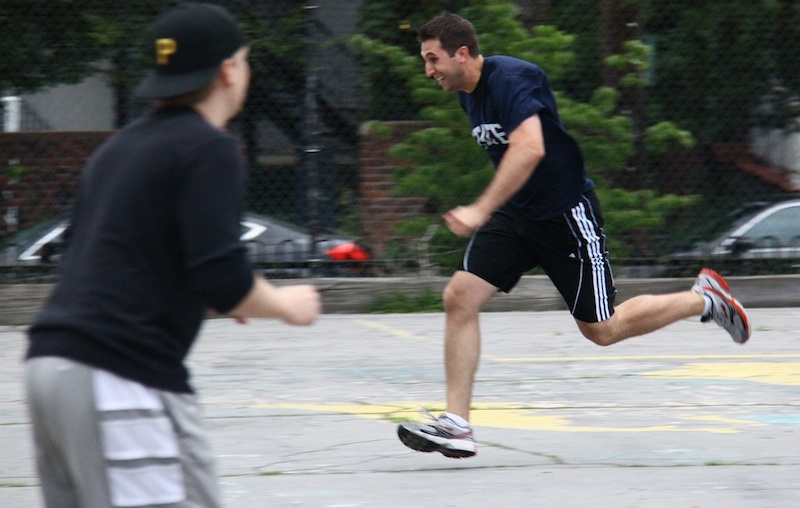 With the score 5-2, Steve continued to gain momentum in the bottom of the third. Brad singled to start the inning, but he was stranded there, as Gaurav flew out to the mound and Holly grounded out to left to end the inning. The Slams chipped further into the deficit in the top of the fourth when Evan led off the inning with a solo homer, making the score 5-3. After Steve flew out to the mound for the first out of the inning, TJ hit a one-out triple, but Gaurav held him there, as he fanned Alec to end the inning. Steve pitched a perfect bottom of the fourth, retiring Mark and Brad in order to hold the Bobby Brown lead at 2 runs. The Slams couldn’t capitalize with the top of their order up in the top of the fifth, as Anthony and Evan were sent down in order. Bobby Brown opened up a bigger lead in the bottom of the fifth, starting when Gaurav singled to lead off the inning. He moved to third when Holly doubled, putting runners on second and third with no outs. Mark grounded out to the mound, but Gaurav raced home on the play, putting Bobby Brown up 6-3. With Holly on third and one out, Brad hit a towering bomb to left field, his second of the game, and Bobby Brown was back on top by 5 runs with the score at 8-3. Steve ended the inning by getting Gaurav to ground out to left, but it looked as if Bobby Brown had put the game away in the bottom of the fifth. Two outs away from slipping the double-header, things turned on Gaurav quickly in the top of the sixth. Despite giving up only 2 runs on 7 hits through the first five innings, the Slams would hit him hard in the sixth. Steve started with a single, and moved to second when TJ singled. Alec hit yet another single, scoring Steve from second and putting runners on the corners with no outs. With the score 8-4, Anthony doubled, scoring the runner from third, and cutting the deficit to three runs. With no outs, runners on second and third, and the tying run at the plate, Evan delivered in the clutch, smashing a 3-run blast to right-center field, tying the game at 8-8. The Slams had come from five runs down to tie the game before recording a single out in the top of the sixth. A run away from taking the lead, the Slams fizzled. Steve struck out for the first out of the inning, followed by TJ grounding out to right to end the inning. Despite blowing their big lead and the win, Bobby Brown still had a chance to score in the bottom of the sixth. The Ham Slams pulled Steve from the mound and switched to Alec. The move worked, as Holly and Mark were retired in order, sending the game to extra innings. Gaurav remained in the game for Bobby Brown, and he retired Alec for the first out in the top of the seventh. But the next batter, Anthony, crushed the first pitch to deep left field, and the line drive homer put the Ham Slams ahead 9-8, their first lead of the game. Gaurav got Evan to fly out to left to end the seventh, but Bobby Brown would need a run to extend the game. 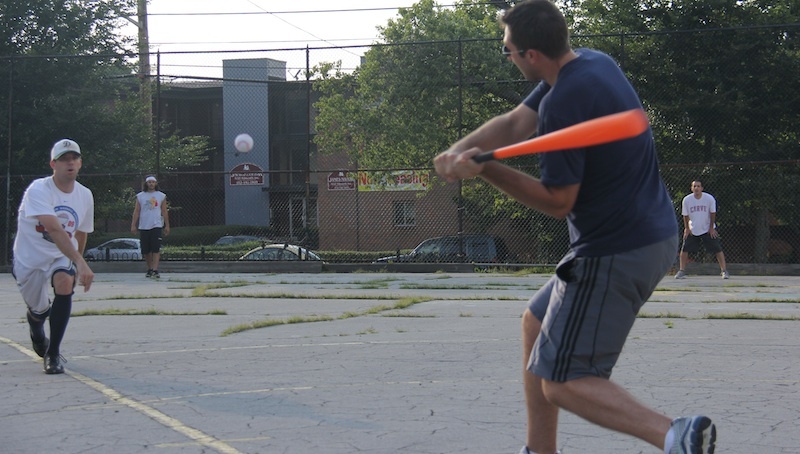 Alec shut the door fast and hard on Bobby Brown in the bottom of the seventh, as Brad and Gaurav were each retired by Anthony, ending the game and giving the Ham Slams the improbable come-from-behind win. The victory moved the Slams to .500 at 7-7 on the season, while the heartbreaking loss put Bobby Brown at a record of 4-10. – Anthony and Evan led the Ham Slams on offense. Anthony went 3 for 6 with a double, 2 home runs, 3 RBI and 3 runs scored. Evan went 3 for 6 with a single, 2 homers, 4 RBI, and 3 runs scored. – Brad led Bobby Brown at the plate in the loss, going 4 for 6 with a single, a double, 2 home runs, 3 RBI, and 3 runs scored. 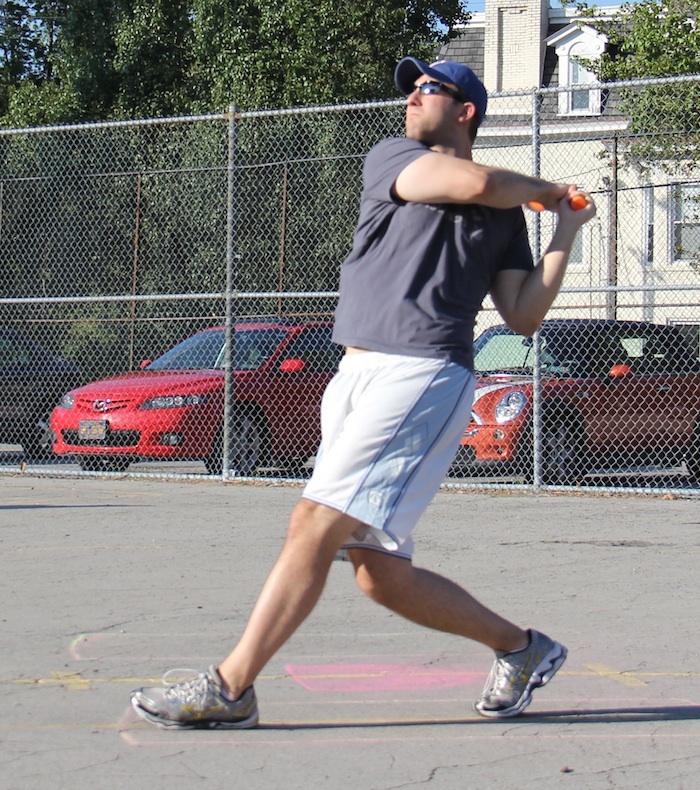 Mark also hit two homers in the contest. – Alec entered the game in the bottom of the sixth inning, and retired 4 consecutive batters in 2 scoreless innings to get the win. 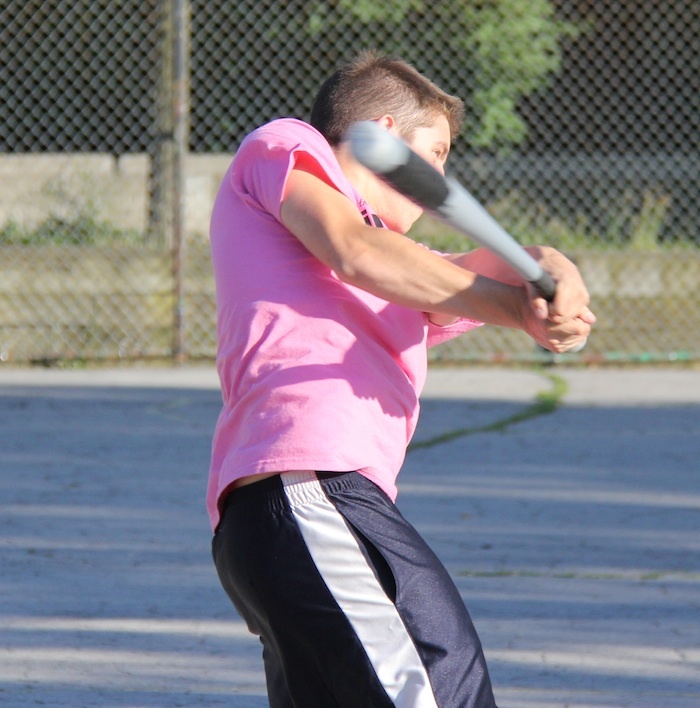 Evan went 3 for 4 with 2 triples and a home run as the Ham Slams never trailed in a 4-1 win over Downtown Bobby Brown. The Slams started Alec on the mound, but he made only a brief appearance in the game. Mark led off the game with a triple, but the Slams stranded him at first, as Brad and Gaurav were retired consecutively to end the inning. Bobby Brown started their ace, Gaurav, and he got off to a good start, sending down Anthony and Evan in order to maintain a scoreless tie. The Ham Slams removed Alec from the game in the top of the second, opting for Steve on the mound. He got Holly to groundout to left for the first out before fanning Mark to end the second. 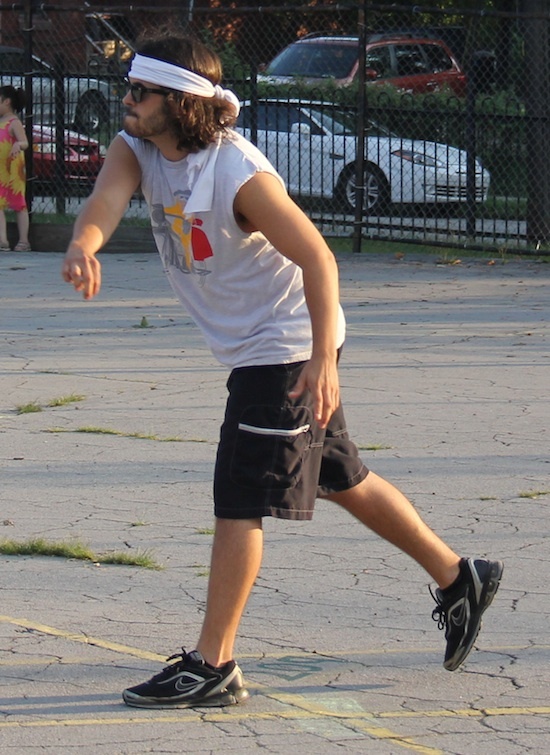 Gaurav continued to cruise in the bottom of the second, as Steve and Alec grounded out to Brad in left consecutively. The scoreless game would continue in the top of the third, as Steve retired Brad and Gaurav in order to maintain the 0-0 score. The Slams broke the scoreless tie in the bottom of the third as they finally got to Gaurav. Anthony led off the inning with a double, and scored when Evan followed with a triple, making the score 1-0. Gaurav got the first out of the inning when Steve grounded out to left, but Evan scored from third on the play, putting the Slams up two runs. With one out and no runers on, Alec grounded out to left, ending the inning. Steve picked up his second strikeout of the game in the top of the fourth when Holly went down on strikes to lead off the inning. Mark followed with a one-out single, but was held at first when Brad grounded out for the second out of the inning. Anthony and Evan sparked a few more runs for the Slams in the bottom of the fourth. Anthony led off with a solo homer, making the score 3-0, and Evan followed with a solo shot of his own, making back-to-back jacks and putting the Slams ahead 4-0. Gaurav settled down following the homers, getting Steve and Alec to fly out in order to end the fourth. Bobby Brown would cut into the deficit in the top of the fifth, but only minimally. 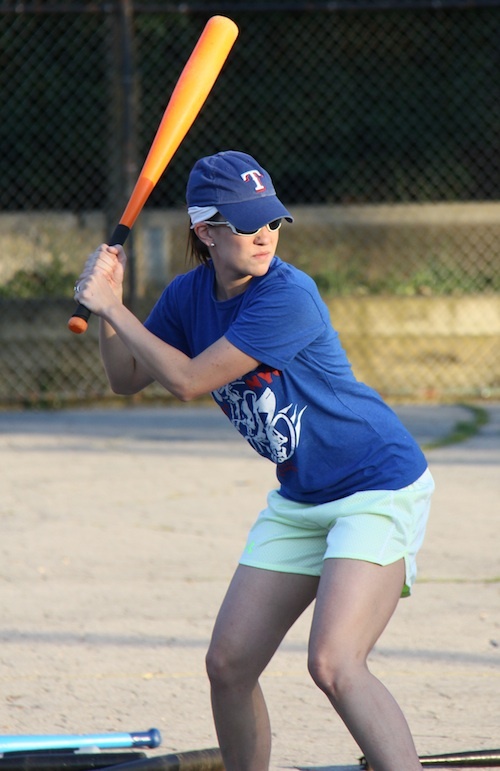 Holly singled to lead off the inning, and scored when Mark doubled. But Mark tried to extend the double into a triple, and was caught in between bases for the first out of the inning. The rally ended there, as Steve got Brad to ground out to left to end the inning with the score 4-1. The Slams couldn’t add to their lead in the bottom of the fifth. After Anthony grounded out to the mound for the first out of the inning, Evan tripled with one out. But Gaurav stranded him at third, getting Steve to fly out to Holly in right for the second out. Up three runs, the Slams kept Steve on the mound to close things out. Brad led off the inning by grounding out to left, and after Gaurav singled with one out, Holly flew out to the mound for the second out, ending the game. 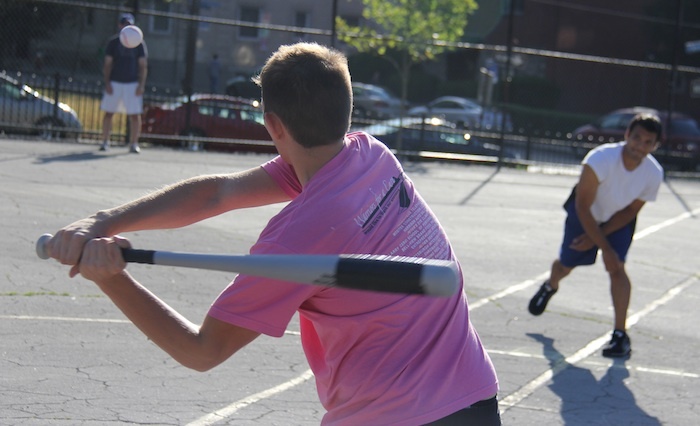 The win moved the Ham Slams to 6-7 on the season, while the loss dropped Bobby Brown to 4-9. 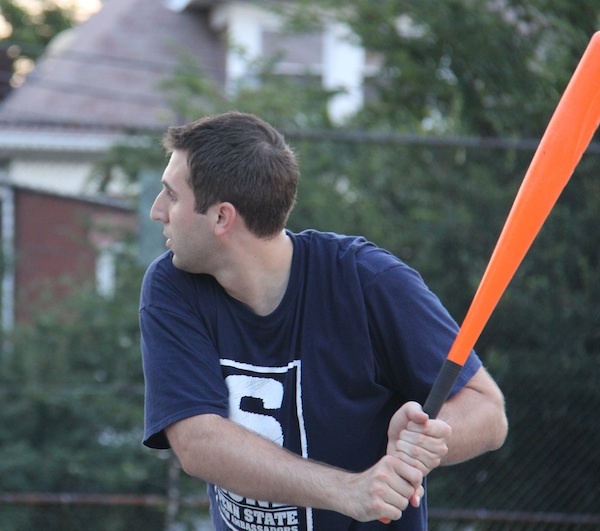 – Evan led the Ham Slams going 3 for 4 with 2 triples, a homer, 2 RBI, and 2 runs scored. Anthony also played well, going 2 for 4 with a double, a homer, an RBI, and 2 runs scored. – Mark led Bobby Brown on offense, going 3 for 4 with a single, a double, a triple, and an RBI. 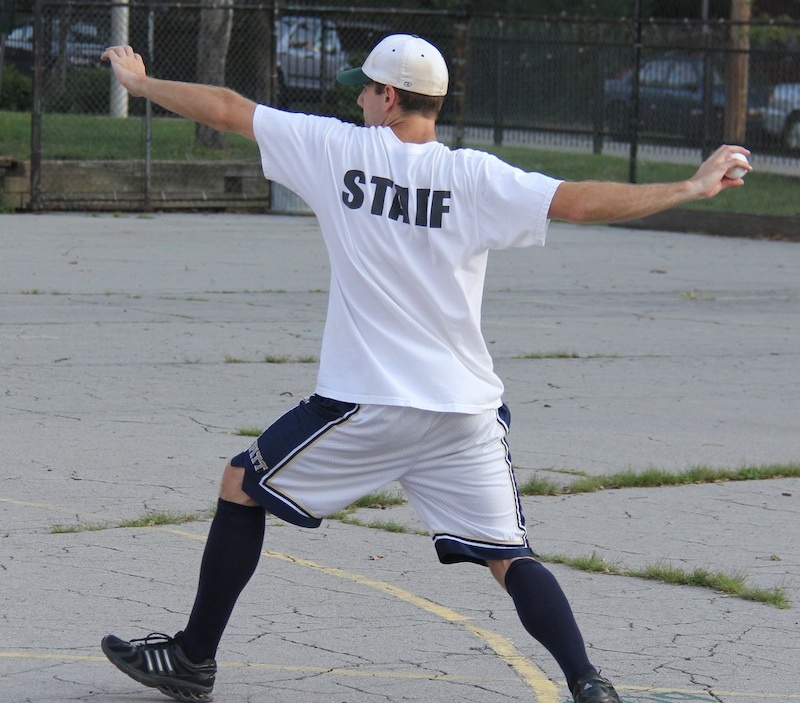 – Steve pitched 5 innings for the win, giving up 4 hits while striking out two. 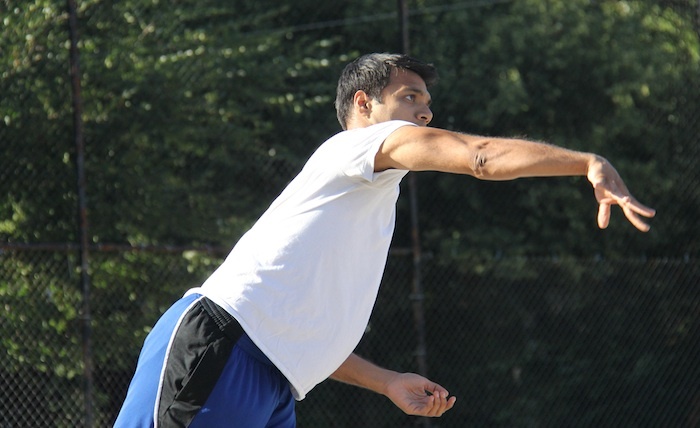 – Gaurav pitched well in the complete game loss, giving up 4 runs on only 5 hits. The Lentz brothers each hit 3 homers and kept the Fish Sticks out of reach as they held off a late rally to win 9-5. The Sticks started Joey on the mound for the second time in week 6, and he got off to a rough start in the top of the first inning. The first batter, Mark, hit a leadoff homer, immediately putting Bobby Brown up 1-0. Joey retired the next batter, Brad, for the first out of the inning. With one out, Mike singled, and moved to second when Mark followed with a single. Joey escaped further damage though, as Brad grounded out to the mound for the second out of the inning, stranding Mike and Mark. Mike started on the mound and brought the heat to the Fish Sticks early. Ivan grounded out to right for the first out of the inning, and Joey was called out after trying to extend a single into a double, ending the inning. Bobby Brown added to their lead in the top of the second. After Mike flew out for the first out of the inning, Mark doubled. With a runner on second and one out, Brad hit a 2-run homer, pushing the Bobby Brown lead to 3-0. Mike flew out to left for the second out of the inning. Mike cruised through the bottom of the second, retiring Blose and Vassallo in order. Bobby Brown would add two more runs in the top of the third, starting with Mark, who led off the inning with a solo homer, his second of the game, making the score 4-0. Brad flew out to left for the first out of the inning, but Mike followed with a solo homer, the first of his career, and the score was 5-0. Joey retired Mark for the first time in the game for the second out of the inning, but the Sticks trailed by five. The Sticks would get on the board in the bottom of the third. Ivan led off the inning by grounding out to Brad in center, but Joey followed with a one-out triple. Blose then doubled, scoring Joey and cutting the deficit to 5-1. With one out and a runner on second, Mike got Vassallo to fly out to the mound, ending the inning and stranding the runner. For the third consecutive inning, Bobby Brown would add two runs to their lead. Brad led off the inning with a solo bomb, his second of the game, making the score 6-1. Mike grounded out to left for the first out of the inning, but Mark followed with a solo shot, his third of the game, and the score was 7-1. Joey had given up six homers in 3.5 innings, and he pulled himself from the game, turning to Blose from the bullpen to minimize the damage. He retired Brad, who grounded out to left, to end the inning. Down six runs, the Sticks went quietly in the bottom of the fourth. Ivan doubled to lead off the inning, but was held at second when Joey flew out to the mound for the first out. Blose followed with a one-out single, but Ivan was called out trying to advance from second to third on the play, ending the inning. Blose made quick work of Bobby Brown in the top of the fifth. Mike led off with a single, but Blose turned a double play when Mark grounded out to the mound, and Mike was caught in between first and second for the second out of the inning. The Sticks cut into the Bobby Brown lead in the bottom of the fifth, starting with Vassallo who led off the inning with a single. Ivan followed with a two-run homer, making the score 7-3. Joey followed with a double, and it looked as if the Sticks would rally as they have all season. The next batter, Blose, singled, but Joey was caught in between second and third for the first out of the inning. With Blose on first and one out, Vassallo grounded out to left, ending the inning and the rally at only two runs. Bobby Brown immediately made up the two runs in the top of the sixth. Brad led off the inning with his third home run of the game, a towering shot to left, putting Bobby Brown up 8-3. The next batter, Mike, hit a low fly ball that barely cleared the right field fence, making back-to-back homers and giving Bobby Brown a 6-run lead. 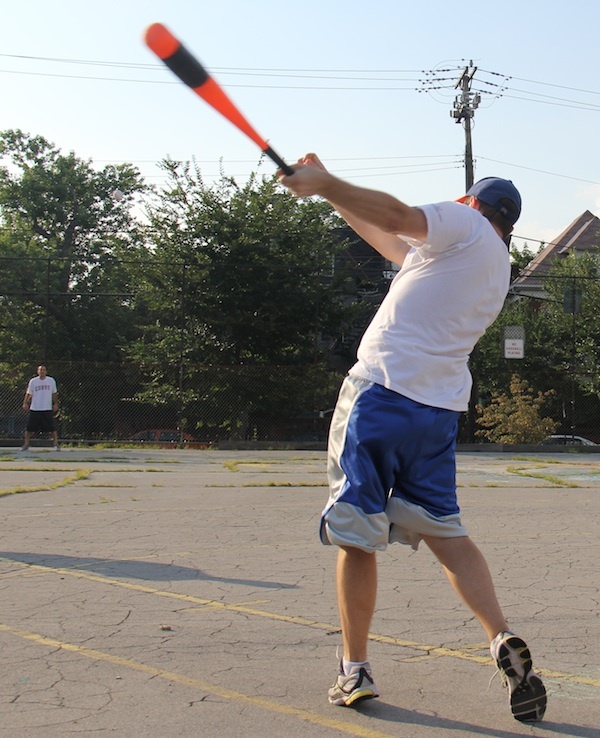 Mark followed with a double, and it looked as if things would get ugly, but Blose got Brad and Mike to fly out consecutively to end the inning. Down 9-3, the Sticks got off to a good start in a comeback bid in the bottom of the sixth. Ivan led off the inning with his second homer in as many at-bats, a solo bomb to right-center that cut the score to 9-4. Mike got Joey to ground out for the first out of the inning, but Blose followed with a solo bomb, and the score was 9-5. With one out and no one on, Mike ended the Fish Sticks rally, getting Vassallo to fly out to the mound, ending the game. 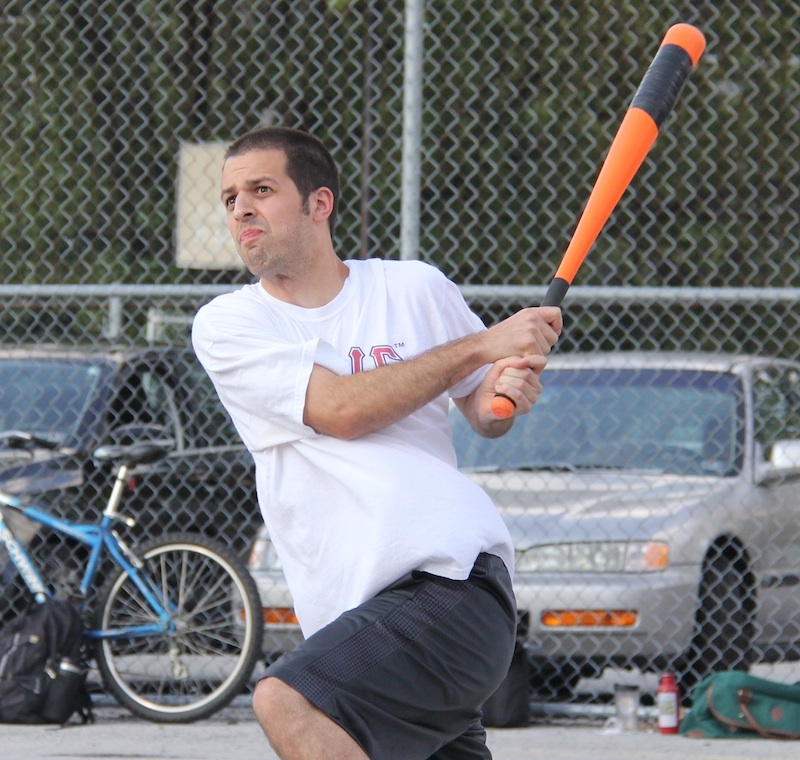 The win moved Bobby Brown to 4-7 on the season in a tie with the Ham Slams in the standings. The Fish Sticks’ loss snapped a 4-game winning streak and dropped their record to 7-4 in a tie with the Caucasians in the standings. Just a game after the first extra innings game of 2012 was completed, the Caucasians went back-and-forth with Bobby Brown before ultimately coming out on top when Morrison’s walk-off inside-the-park home run put them ahead 6-5 in the bottom of the seventh. The Caucasians started their ace, Guthrie, on the mound. He retired Mark, who grounded out to right, for the first out of the inning. But with one out, Brad came to the plate and crushed a ball over the left-center field fence for a solo homer, putting Bobby Brown ahead 1-0 early. Guthrie avoided giving up a big inning, retiring free-agent acquisition Mike for the second out of the inning. Bobby Brown sent Mark to the mound. He had been hit heavy in previous outings, but pitched well early. He got the league’s hottest hitter, Morrison, to groundout to left for the first out of the inning. After Guthrie singled with one out, Les grounded out to Brad in left, stranding the runner and ending the inning. Guthrie pitched a perfect top of the second, as Mark and Brad grounded out consecutively to end the inning with the score 1-0. Mark matched Guthrie in the bottom half of the inning. Ron led off the inning with a single, but Mark stranded him as Morrison and Guthrie were each retired by Brad, maintaining Bobby Brown’s 1-run lead. Guthrie continued to roll in the top of the third, as Mike and Mark were retired in order. 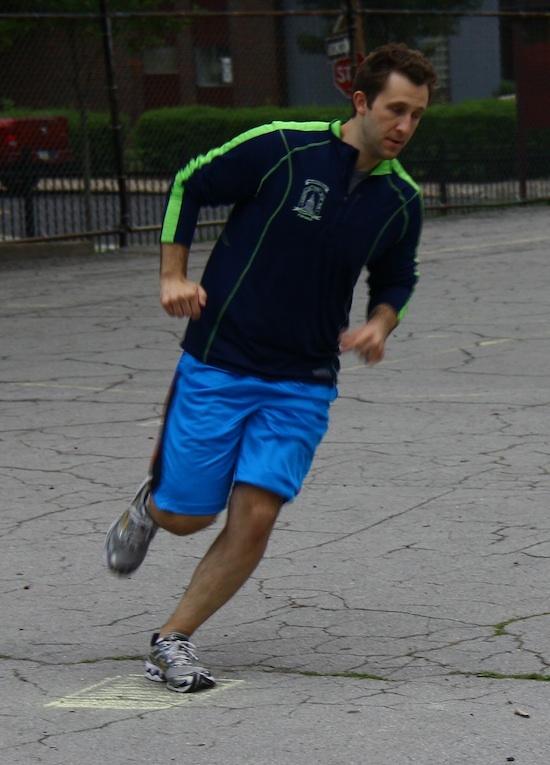 Mark showed his first sign of weakness in the bottom of the third, as the Caucasians would even things up quickly. Les singled to lead off the inning, and when Ron followed with a single, Les rounded the bases, scoring from first and tying the game at 1-1. Morrison followed with a double, putting runners on second and third with no outs. But Mark buckled down and escaped without more damage, as Guthrie and Les each flew out to the mound, stranding both runners. With the game tied at 1-1, Brad hammered Guthrie again, as he led off the inning with a solo blast, his second of the game, putting Bobby Brown back on top 2-1. Bobby Brown couldn’t add more runs, however, as Mike and Mark each grounded out to end the top of the fourth. 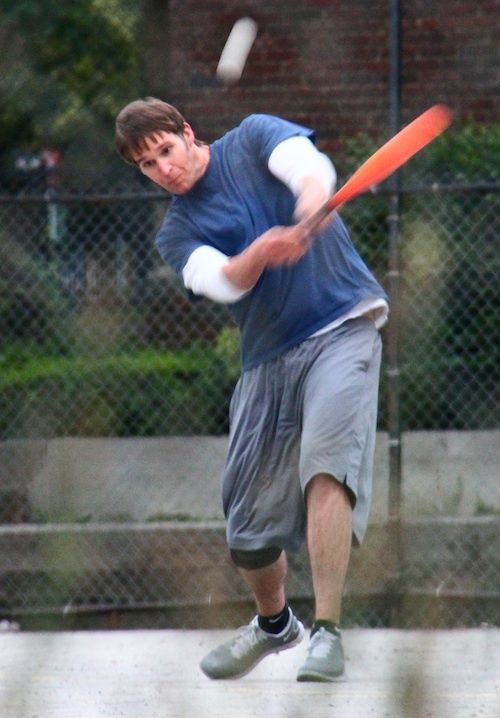 The Caucasians bounced back in the bottom of the fourth, starting with Ron, who doubled to lead off the inning. Morrison capitalized, slamming a 2-run bomb to left-center, which put the Caucasians ahead 3-2. After Guthrie grounded out for the first out of the inning, Les singled with one out, but Mark stranded him at first by retiring Ron to end the inning. Guthrie was pitching well, but couldn’t get one past Brad. He led off the top of the fifth with another blast, his third of the game, and tied the game at 3-3. Mike and Mark were retired consecutively to end the inning, but the Caucasian lead had been blown. The Caucasians couldn’t get it back in the bottom of the fifth. Morrison grounded out to left for the first out of the inning, and after Guthrie singled, Mark retired Les, who also grounded out to Brad, to end the inning. With the score tied at 3-3, Brad continued to hit Guthrie, leading off the top of the sixth with a single. He moved to second when Mike followed with a one-out single, and Mark came to the plate with runners on first and second and no outs. He singled off the wall, driving in Brad from second and putting Bobby Brown ahead 4-3. Guthrie finally retired Brad for the first out of the inning, and the runners moved to second and third on the plate. Bobby Brown had two runners in scoring position, but Mike couldn’t deliver, as Guthrie retired him to end the inning and hold Bobby Brown to only a single run. The Caucasians needed a run to stave off the upset by Bobby Brown, and they started the inning right when Ron doubled. Morrison followed with a double, helped by fielding errors, but Ron couldn’t only advance to third. The Caucasians had the tying run on third, the winning run on second, and no outs. The next batter, Guthrie, hit a towering fly ball to left field. It fell short of the fence, as Brad caught it for the first out of the inning, but Ron raced home on the sacrifice fly, tying the game at 4-4. Mark retired the next batter, Les, stranding Morrison at second and sending the game to extra innings. Bobby Brown got right to work in the extra frame, as Mark led off the top of the seventh with a single. Brad continued to come through for Bobby Brown, lining a single into the tree in left, as Mark raced around from first to score, putting them ahead 5-4. The next batter, Mike, grounded out to left, advancing Brad to second with one out. The Bobby Brown rally ended there, however, as Mark grounded out to Ron in right field to end the inning. The Caucasians were down a run heading into the bottom of the seventh, and they needed one more rally to avoid the loss. For the third time in the final four innings, Ron led off the inning with a base hit, a single, and the tying run was on first. Morrison, who has crushed homers all season, came to the plate as the winning run. He didn’t hit a blast out of the park, but hit a liner off the fence, and after a series of fielding errors, he and Ron both raced the entire way around the bases for an inside-the-park two-run walk-off homer. The Causians, who had trailed multiple times in the game, had come from behind to beat Bobby Brown 6-5 in extra innings. 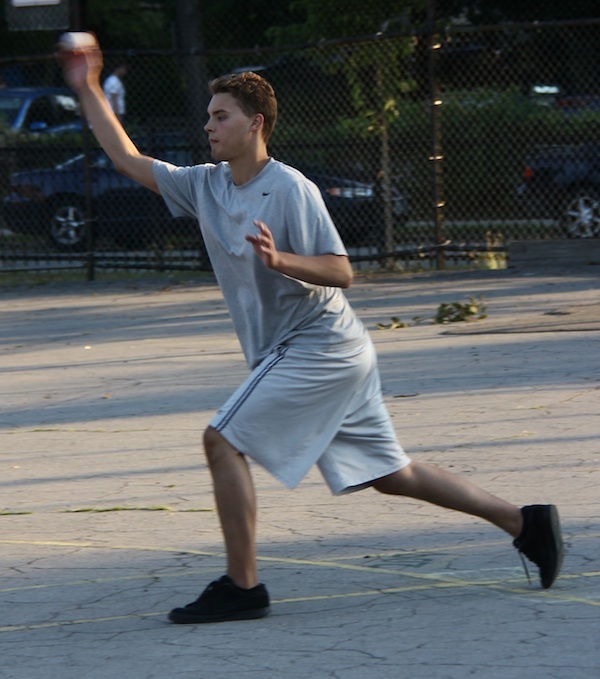 The win moved the Caucasians to 6-4 on the season, while the loss dropped Bobby Brown to 3-7. – Ron and Morrison led the Caucasians offensively. Ron went 5 for 6 with 3 singles, 2 doubles, 3 runs scored, and an RBI while recording 6 putouts in the field. Morrison went 4 for 7 with 2 doubles, 2 homers, 2 runs scored, 4 RBI, and 5 putouts. – Brad led Bobby Brown at the plate, going 5 for 7 with 2 singles, 3 homers, 4 runs scored, and 4 RBI while putting together what may have been the best fielding performance of the 2012 season. 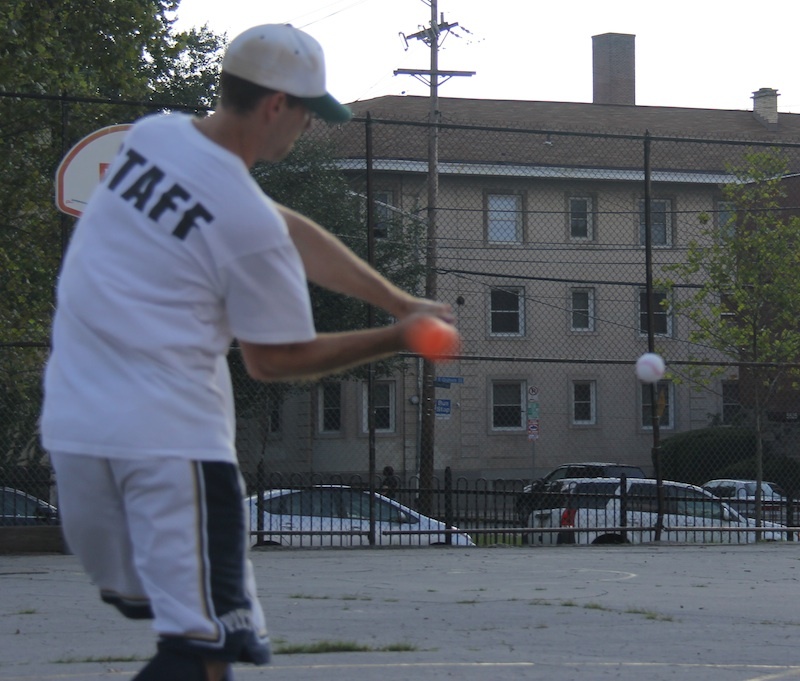 He was all over the wiffle diamond, recording 10 of a possible 12 putouts.